Head honcho Brian Behling is now blogging and is ramping up with both NATC MotoTrials on Facebook and NATC MotoTrials on Twitter. So we’ll be hearing directly from him (and maybe other NATC board members) about the Nationals and the US TdN Team using these social media channels. He’ll be trying to use the words ‘mototrial’ and ‘mototrials’ as much as possible instead of ‘observed trials.’ Or will he use two words for each, ie, ‘moto trial’ and ‘moto trials’ and really confuse us? Full disclosure: the NATC contracted with my firm, Wigley and Associates, to help them with this. The North American Trials Council (NATC) held their annual meeting over the weekend. Among the highlights at the meeting was a decision (PDF press release) to use the term ‘MotoTrial’ instead of the phrase ‘Observed Trials’ for the sport. 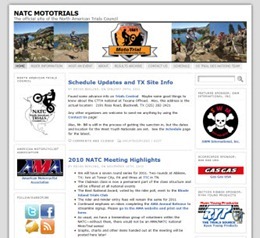 The annual meeting of the North American Trials Council (NATC) concluded on Sunday October 24, 2010 with a new, updated name for the sport of Observed Trials – MotoTrial – will now be the term used to define this unique and oldest form of off-road motorcycling in the USA. “We have been watching and listening closely to our national riders across the country and around the world, noting the movement towards this type of short name that’s easy to say, helps define our sport as one involving a motorcycle, while updating it to fit with 21st century trends”, said Brian Behling, C.E.O., NATC. “With the increase of motorsports now incorporating this abbreviated type name (MotoGP, Moto2, Moto-X, etc.) it just seemed to be the right thing to do at this time to help move recognition of this incredible sport a little more into the mainstream,” noted Behling.